This book is about Education, Diversity and Inclusion. The "Being Gay is Okay Book" is considered controversial by some and contains information for adults, educators and older children. Subject matter in the book is realistic, constructed biographically with integrity and in no way encourages any sexual behavior. This book relfects truth and reality. When a parent finds out their child may be gay, this book may be helpful. 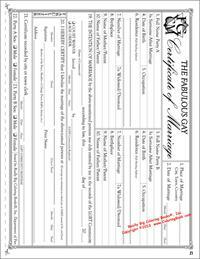 In the USA every 24-36 months, 500,000 to one million children begin to think or discover they may be homosexual. This book helps a family begin to understand the thoughts that have developed in the mind of an individual. The book takes a common sense approach to the subject for a family or person who wishes to further their understanding of the LGBT community. It can be used to help explain a friend, family member or a neighbor is Gay and can also be used as an anti-bullying book. Allison Sallee, who is a psychologist with Tejas Family Guidance, says some kids question their sexuality at a very young age. "I've definitely had kids who believe they may be gay, lesbian or bisexual come in at 10 or 11," said Sallee. 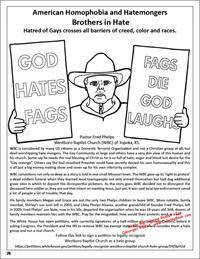 Sallee believes the 40-page coloring book -- complete with a sample coming out letter -- and gay celebrity trading cards -- is a great teaching tool -- for any age. "It's a really non-threatening way to talk about that. I like that," added Sallee. 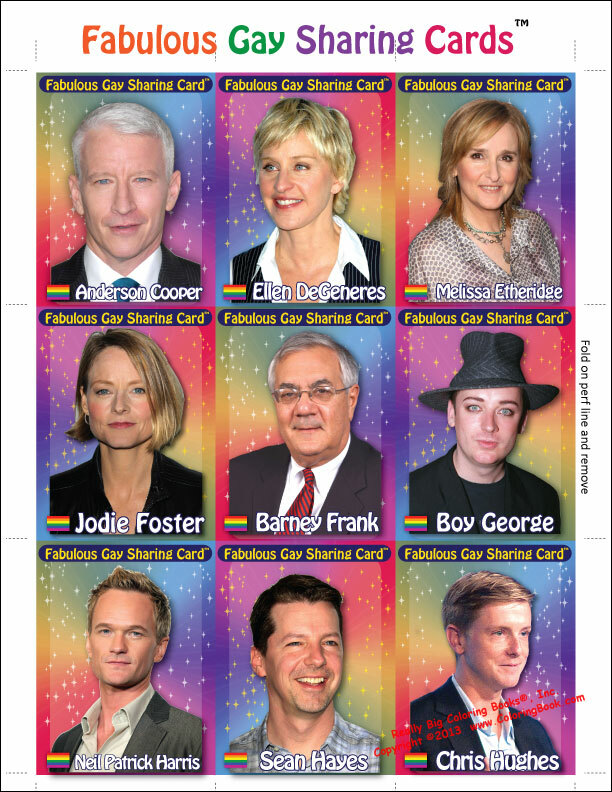 "A practical (and fabulous) approach for children, adults, and educators to address gay life. The book can act as a fun coffee-table conversation starter, an introduction into gay culture and history, and/or a guide for folks who may be struggling with understanding their own sexuality or the sexuality of others. 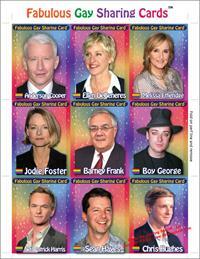 Or you can just marvel that there are gay trading cards. Overall, the novel’s main message is that being gay is something to be celebrated and there is community, history and resources to be found in LGBTQ culture. 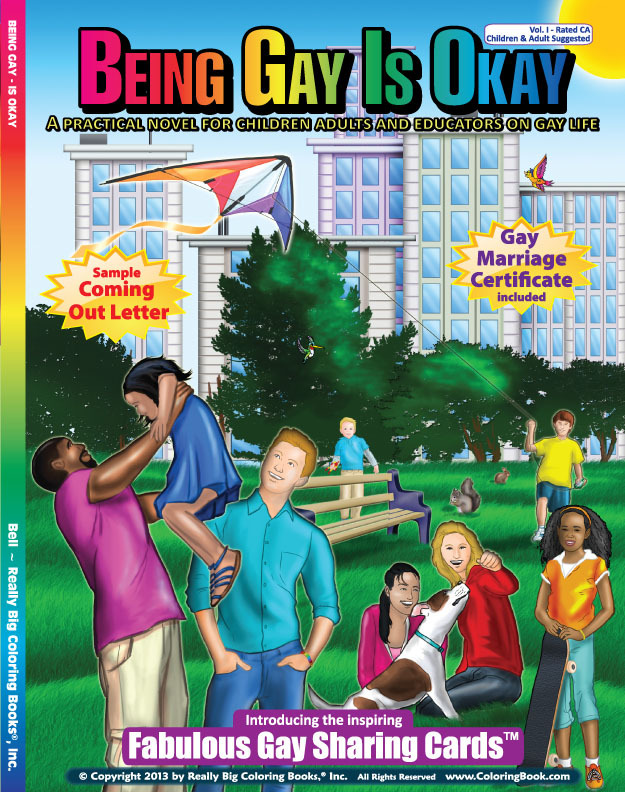 If you're looking for a great way to educate a child or friend or want to spice up your road trip or waiting room, check out Being Gay Is Okay. Or just buy it to have fun at your next dinner party." By Chloe Fitzpatrick OUT Magazine Here Media Inc. In a US citizens lifespan of 73 years, there will be a minimum of 40 million Americans born that will grow up lesbian, gay, bisexual or transgendered. This discovery of being Gay will need discussion. Everyone knows the topic itself is not new. This approach to the subject, for educators, parents and their children, is new. At a time of interest, this book offers the reader, true-to-life examples of people that have already grown through the Gay discovery time period of life. It educates highlights and brings forth positive discussion about the topic. The book does not promote a specific LGBT agenda and reading this book will not make a person Gay, nor does the book encourage any person to become Gay. The book showcases what already exists and provides a positive reflection with role models than anyone can look up to. Dr. Deb Pontillo - a pediatric psychologist and expert in child development, behavior, and learning. Pontillo thinks most of the book will simply go over a child's head with no harm, but she also sees pages they will understand, like the one with a family with two dads, and she says that's a good thing. "You know, we're not talking about sexuality. We're not talking about what that means to be in love. We're just talking about different kinds of families, and everyone's family is different and here's what my family looks like, and let's color it," said Pontillo. What Pontillo really likes about the book is that it's a creative way to get people talking about an issue many find uncomfortable, but must face. 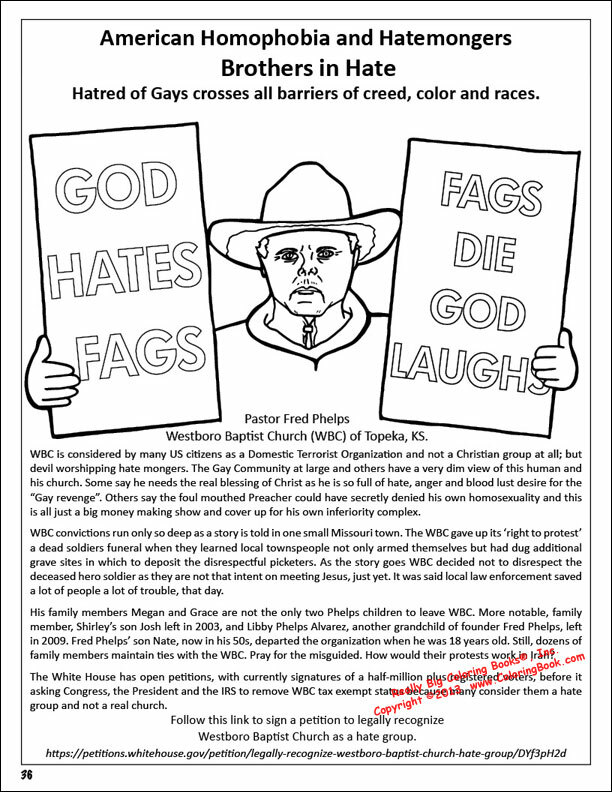 Controversial gay coloring book hits store shelves. 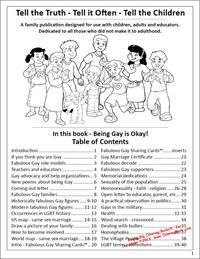 Coloring Book for kids "Being Gay is Okay"
Parents and teachers have a new way to talk to kids about homosexuality: a coloring book called "Being Gay Is Okay." 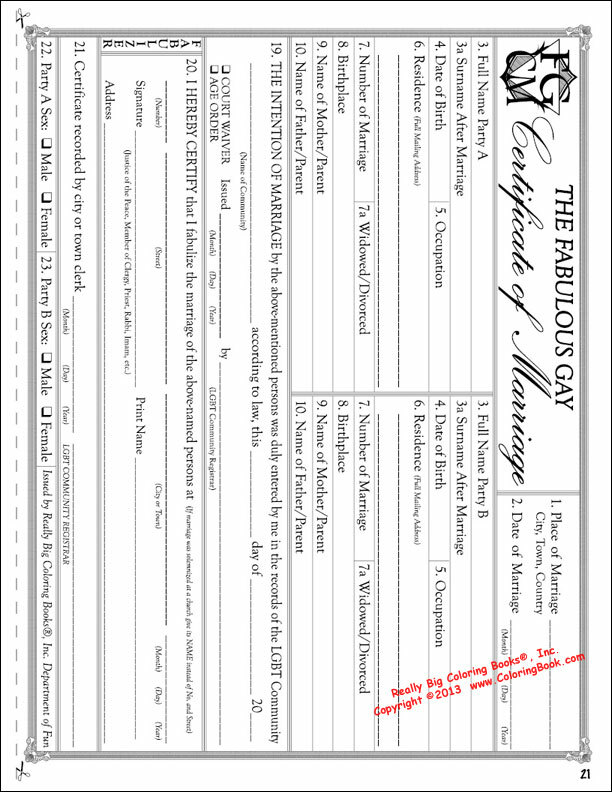 The book has bright colors, features a gay marriage certificate and a sample coming out letter. "First and foremost it is a coloring book, but the trading card part seems like an interesting idea." 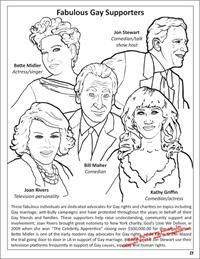 Coloring Book wants kids to know "Being Gay is Okay"
The coloring book includes trading cards of famous gays and lesbians (Anderson Cooper, Jodie Foster, Barney Frank and more), a gay marriage certificate and a sample coming-out letter." 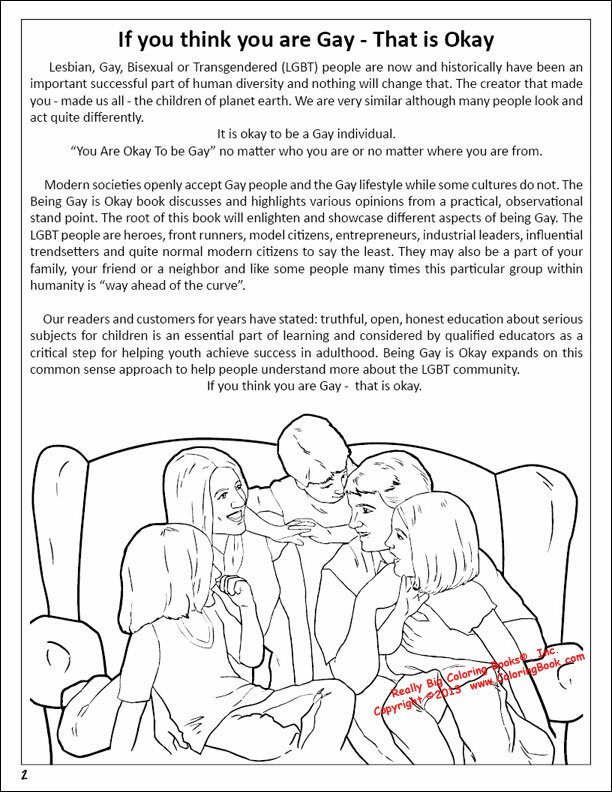 Look: Innovative New Coloring Book says: "Being Gay is Okay"
A colouring book for children called Being Gay is Okay has been released this week. Described as a "practical examination of LGBT (lesbian, gay, bisexual, and transgender life)". 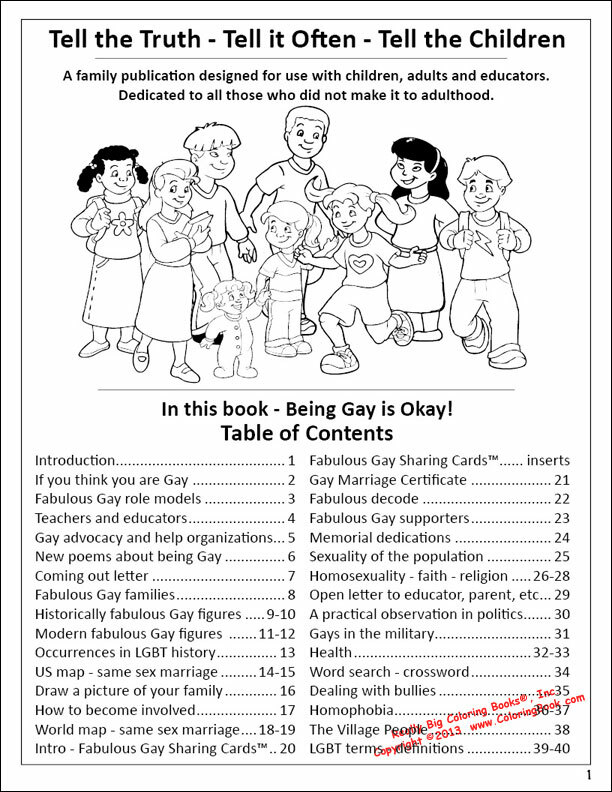 A colouring book for children called ‘Being Gay is Okay’ AWESOME! We ordered 6 books. I am sure we will get more soon enough. Already Jane in our office has traded her Bernie Sanders and Richard Chamberlain for my Jody Foster. Mysteriously, Jody Foster went missing from Neven’s copies as well. All positive vibes for the big coloring book company! THANKS. This book was a long time coming, congratulations. Our office purchased five. 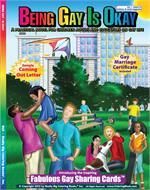 The "Being Gay is Okay" book brings home a thought provoking reality that being gay really might be okay. Friends and I went through this book. It is an interesting book, educational, informative and not 'inappropriate' as my one conservative buddy expected. The people mentioned inside are successful, modern, everyday, famous and true to life role models. Excellent examples anyone can look up to. The only "fault" my one conservative friend could find, is that some of the people are gay, which is not a fault at all. I think this company is engaging people in heavy discussion with the book. Admittedly one friend said it really him made him uncomfortable to think being gay is okay, direct opposite of his upbringing. While addressing a core belief is not easy, accolades on the work, let alone, the bravery it took to publish and distribute. I think the coloring book company understands some individuals will accept this product while others will take offense at the mere name. As Martin said......Keep Hope Alive. Just what the country needed. After reviewing the beautiful sharing cards and reading through the book, my partner and I left it out for our grand children to find when they came over today. One child is 14 and the other is 12. What a great time and conversation we had about gay people. Just what the country needed; plain spoken, easy to understand, elegant and a classy representation of wonderful human beings. An interesting day and evening with an incredible new coloring book. This took a tiny little burden off our shoulders. Thanks.